Costa Mesa City Councilwoman Katrina Foley, along with Councilwoman Sandy Genis, held a little public workshop in City Council Chambers at City Hall last night to inform interested members of the public on a few issues about which Foley has been getting inquires. A couple dozen people attended the meeting, along with a few members of the staff, who provided the background and were available to answer questions. First up was Recreation Manager Justin Martin, who provided us with an update on the recently-renovated Bark Park. The 10 week makeover/expansion was successful and users seem to appreciate the new turf, shade and furniture, plus other features. 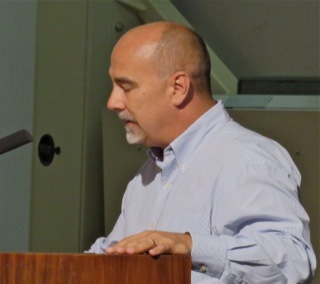 CEO Tom Hatch spoke on the pet licensing process, indicating that approximately 36% of Costa Mesa residents are pet owners. He provided us with some very interesting statistics. He also went over the process of licensing your pet. Genis chimed in with a comment about needing to have a chip inplanted in your pet to help with retrieval if it gets lost. CMPD Lieutenant Vic Bakkila then spoke about the new arrangement with the Humane Society for the operation of a facility on Hamilton in Huntington Beach - just across the Costa Mesa border - which will be shared with Garden Grove. Genis suggested the facility could use lots of volunteers to help with the site - and to be eyes and ears for The City in case things don't go well. A half-dozen people asked questions from the audience including the use of artificial turf (Martin said we have a test strip now); the availability of dog waste bags (in theory we provide those bags at all parks); the possibility of becoming part of the new, modern County animal shelter (Foley said someone would get back to that person); how to contribute money to help with the maintenance of the Bark Park(Foley suggested contributing to the Community Foundation with the money earmarked for Bark Park use). 4 - Community Engagement and Awareness, including knowledge of our partnering with the Humane Society. He also mentioned a September 15th Pet Prep Rally, which will include a mobile vet to administer free rabies innoculations and pets available for adoption. In October there will be something called the Howl-O-Ween. Next came the discussion of Permit Parking throughout the City. 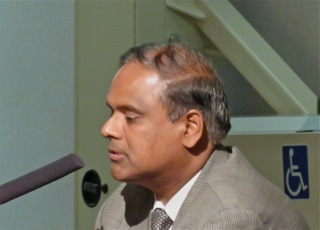 Transportation Services Manager Raja Sethuraman took the lead on this segment. Foley, discussing the impact of strangers parking in her Mesa Del Mar neighborhood - mostly college students from Orange Coast College - reminded us that the first week of parking at OCC each semester is FREE. She also reminded us that after that it's only $30.00 per semester. 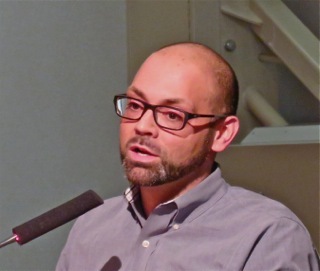 Genis spoke about landlords renting out garage space and creating on-street parking problems. Raja told us that Permit Parking in residential neighborhoods was first the result of the Orange County Fair. Then the demand spread to neighborhoods near commercial venues. Now the impacts are coming from the large number of apartments in the city. He told us to have an area receive permit parking 51% of the neighbors must sign the petition - a sample can be provided - and that 70% of the usable parking (on street and in driveways) must be taken up during an inspection. He said we currently have 2,000 homes with parking permits. The City is divided into six zones and the permits are color-coded so they cannot be used in other zones. Each permit is good for 3 years. 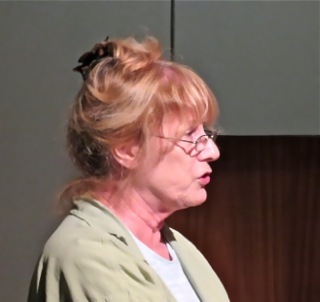 Eight members of the public, like Beth Refakes, address several elements of this issue. Some spoke of businesses being run out of garages, foreclosing them being used for parking. Others spoke of owners of a half-dozen cars using the streets to park them. Others spoke of the frustration of years of reporting problems but having no resolution to them. Others addressed obviously commercial trucks/trailers that are being left in residential neighborhoods. Lt. Bakkila encouraged them to call the parking hotline - 714-754-5290 - to report a problem. He said they love to haul those trucks away. He mentioned that the CMPD used to have 8 Community Service Specialists (CSS) assigned to work on parking issues. The staffing cuts in the CMPD lost all those people. Presently there are seven (7) part time aides attempting to cover the entire city. He mentioned he would work on training his sworn officers on recognition of parking decal for individual zones in the city. Finally the discussion turned to Street Sweeping - which has been outsourced to a private company - and the difficulty folks are having in some neighborhoods because cars clog the curbs during sweeper day. Raja told us that if 50% of a section of street is not swept it could qualify for posting "No Parking On Sweeper Day" signs. He told the audience to call the Transportation Department line - 714-754-5343. He did mention that on holiday weeks - like the upcoming Labor Day holiday - NO streets will be swept due to conflicts with trash pickups. The meeting ended promptly at 7:30 and the attendees seemed generally satisfied with the information they received. There will be follow-up with specific neighbors on some of their specific concerns. It was a good start and a comfortable process with excellent opportunities for residents to interact with staff and council members informally. Menninger probably has a half dozen cars, and typically parks one in his big new driveway/garage. The rest continue to be on the street - the truck, the Benz, the Mustang, etc. It's good to be king, I guess. 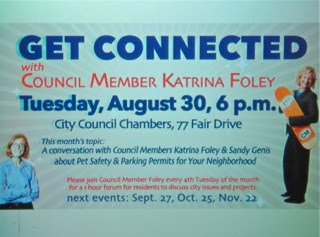 Thanks you Sandy Genis and Katrina Foley, for reaching out to the residents and our concerns. Parking permits, huh? Who is going to enforce that? If you call on a car in your area without a permit, will it have to 36 hours before it can be towed? I guess I should have gone to the meeting. WHY DOES COSTA MESA HAVE INCREASING CRIME? 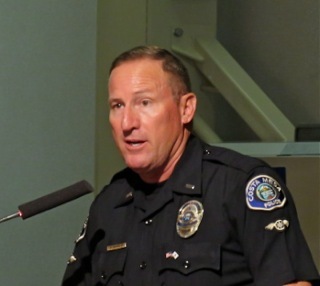 • Costa Mesa’s Police Force is down from 165 sworn officers to only 100. • While the State released thousands of offenders to our cities’ streets, Mayor Mensinger and his cronies in the City Council majority put a year-long hiring freeze on the Police Department. Many experienced officers fled to other cities or retired sooner than planned. Recruitment after the freeze ended has lagged. • Mayor Mensinger and his cronies in the City Council majority sold our helicopters and terminated the ABLE (AirBorne Law Enforcement) program. We lost a “force multiplier,” making the loss of officers even worse. • We now have only 3 motorcycle officers out of 16 we had before Mayor Mensinger and his cronies in the City Council majority took over. • Costa Mesa no longer has enough cops to staff a gang unit or a canine unit or to do crime prevention. VOTE for Sandy Genis, Jay Humphrey and John Stevens to restore public safety!